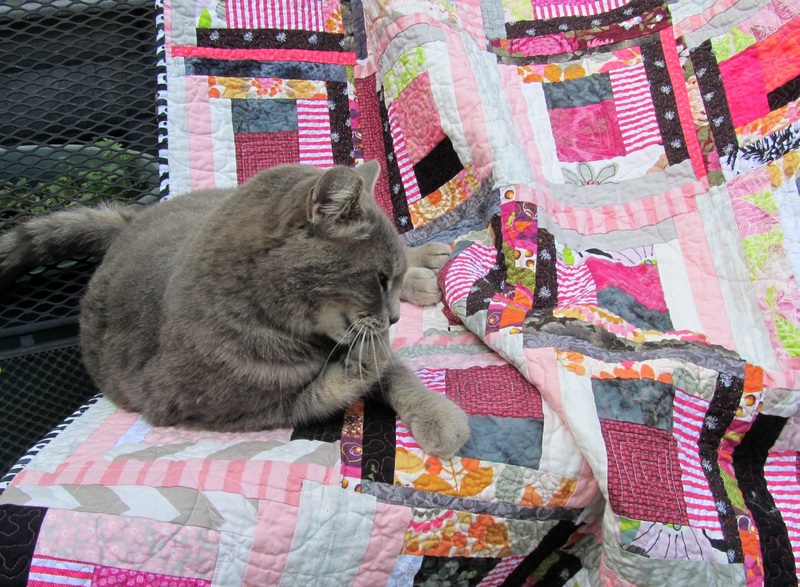 Nothing in, nothing out this week, but that should change next week, as I finish this Scrap-in-a-Box quilt. I did well on my goals this month. 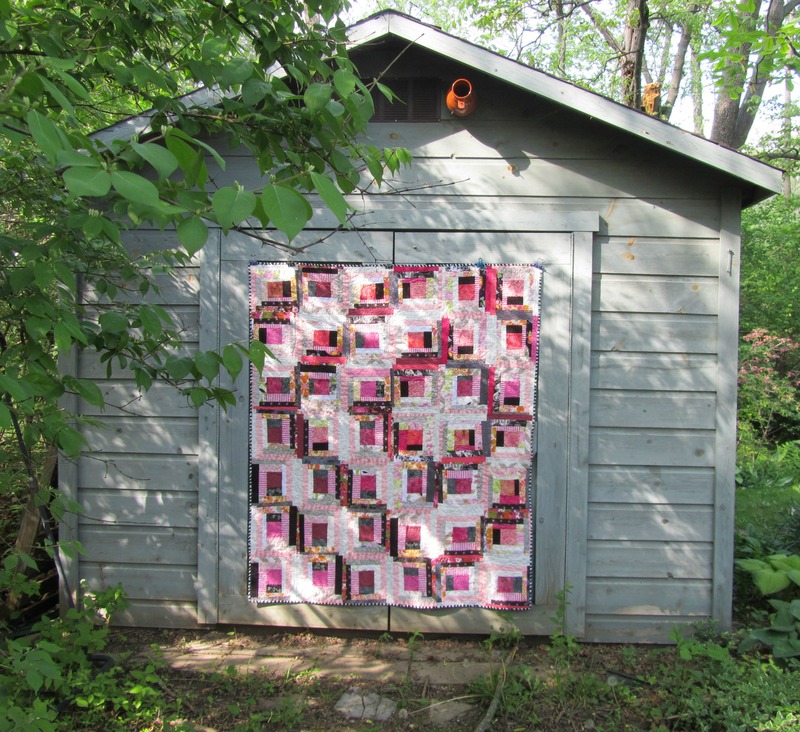 Some quilters are doing theirs weekly. I can see where this could work well, especially if you have a busy, structured work week, and this helps you accomplish some specific tasks. 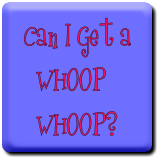 In my retired (and DH retired) state, my days and weeks are more free-form and less predictable. Some weeks I get lots of sewing time and really burn through projects. Others seem to hold nothing but family gatherings, outings, trips, etc., and I get little done. And I’m trying to be okay with that. So the monthly goals give me more flexibility, but still some focus. 2. Quilt and bind Charlotte’s Scrap in a Box Mystery Quilt. 3. Attempt a photo transfer technique for a Coastal wall hanging. 4. 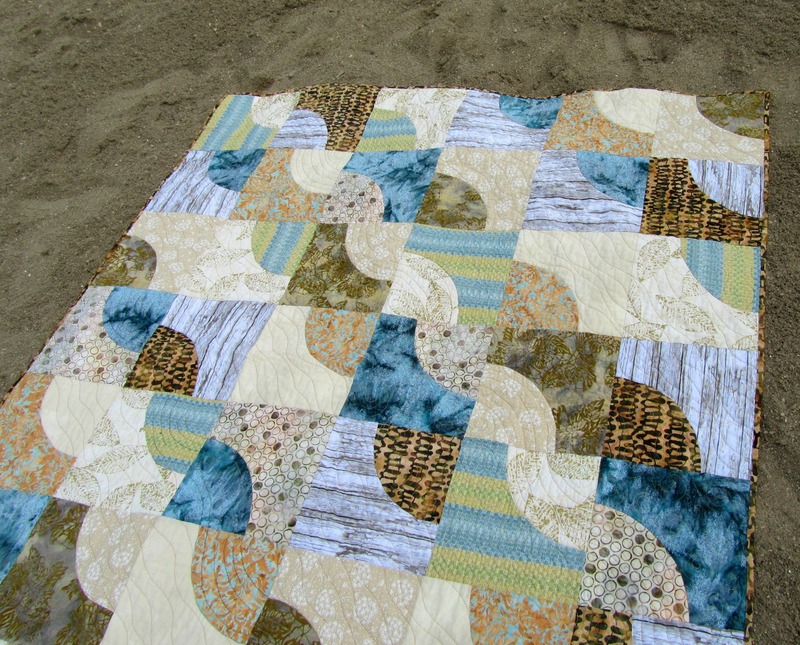 Assemble quilt blue and gold leaders and enders units into a top. How are you doing on your goals? Happy June to you tomorrow! 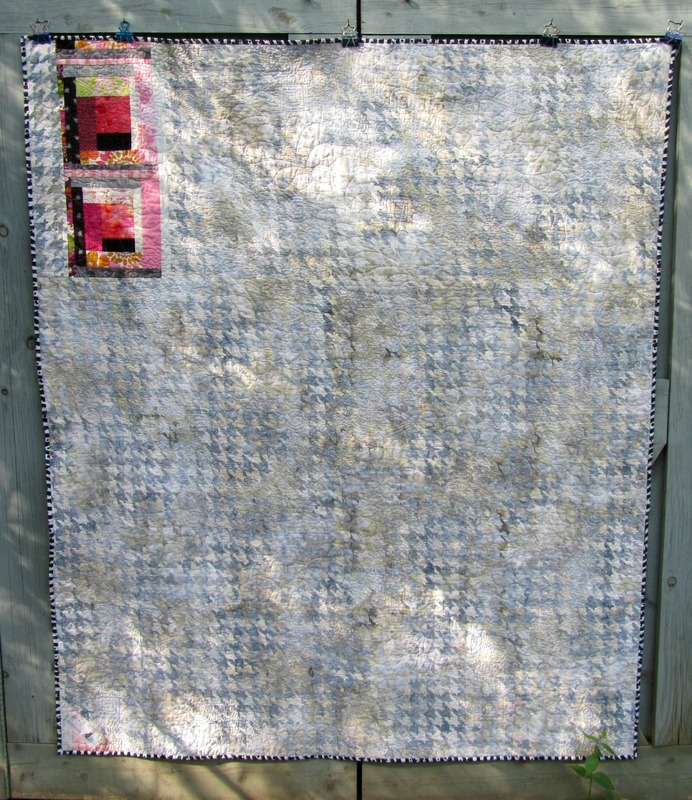 I’m linking up to Judy’s fabric report at Patchwork Times. Good numbers this week! 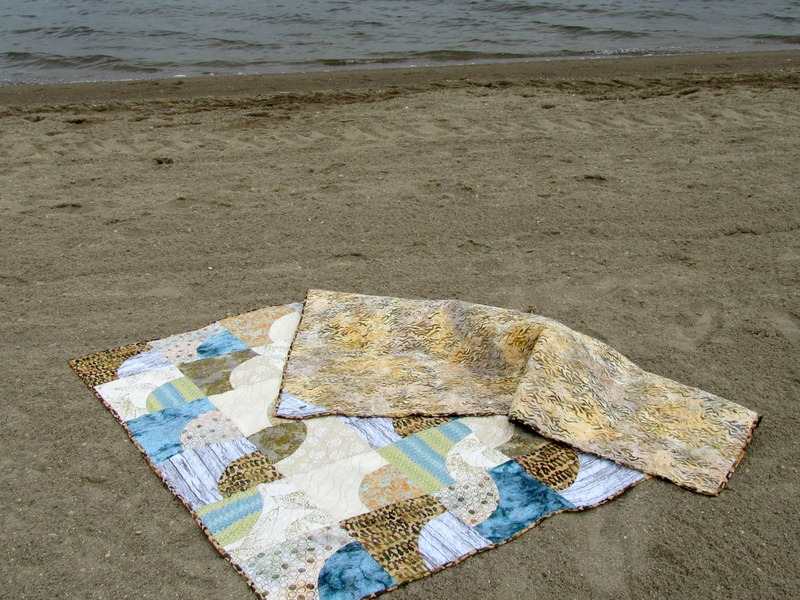 I finished Beach Drunk, which used about seven and a half yards, and I didn’t buy any fabric. 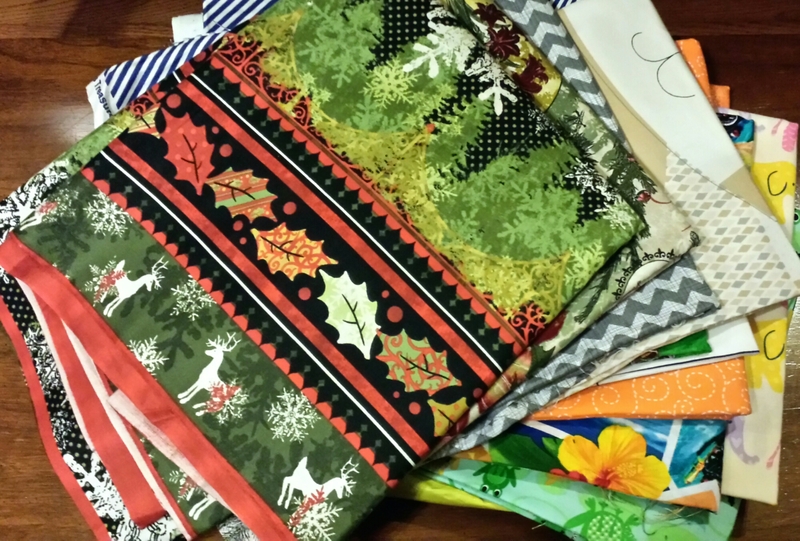 And I’m working on adding the sashing to Scrap-in-a-Box, so that should come out in a couple weeks. Are you using your stash, or spending all your time in the garden? It happens! 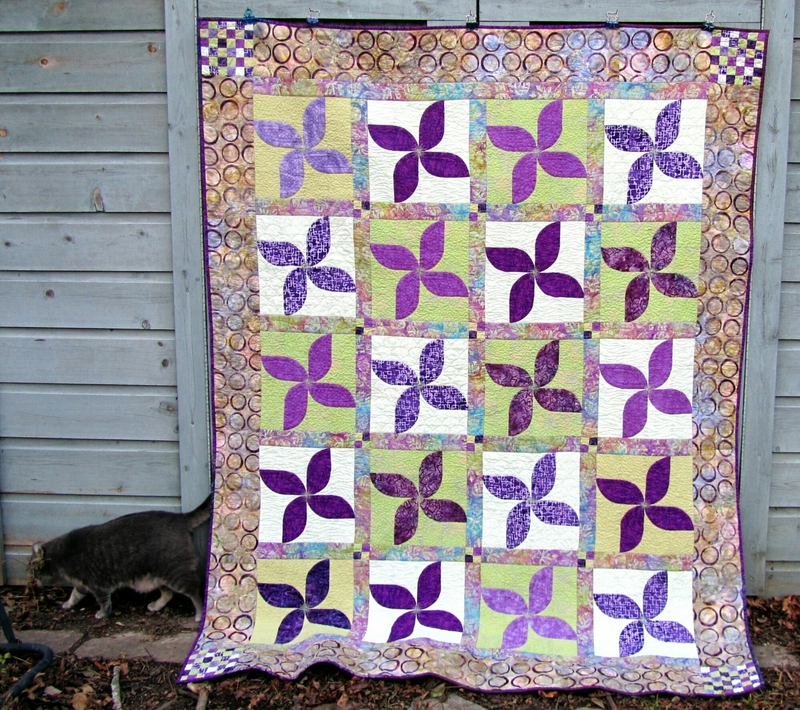 I’m entering “Spring Violets” in the Home Machine Quilted category of this spring’s Blogger’s Quilt Festival over at Amy’s Creative Side. 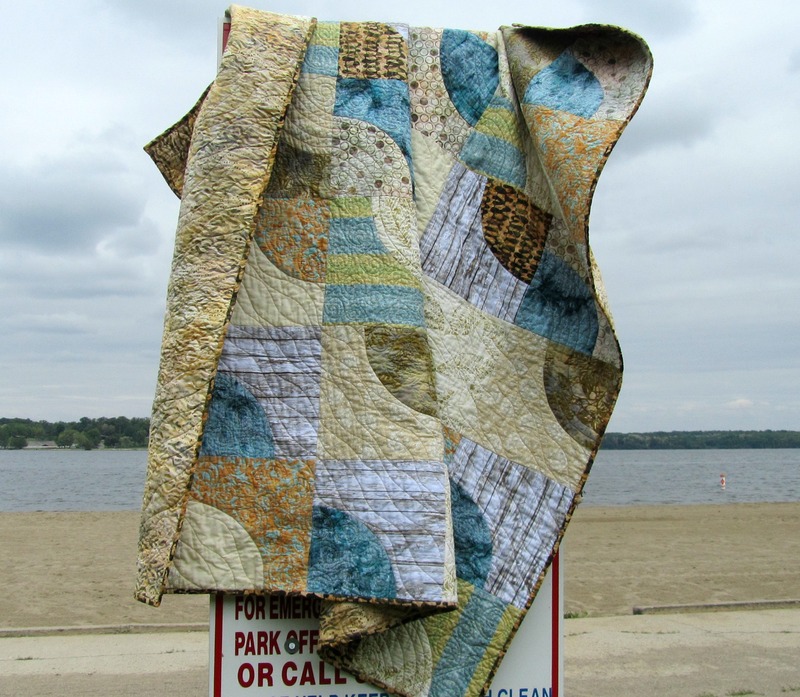 This quilt measures 66″ x 84″. The batting is Warm and White. And, yes, that’s Yuri helping out. 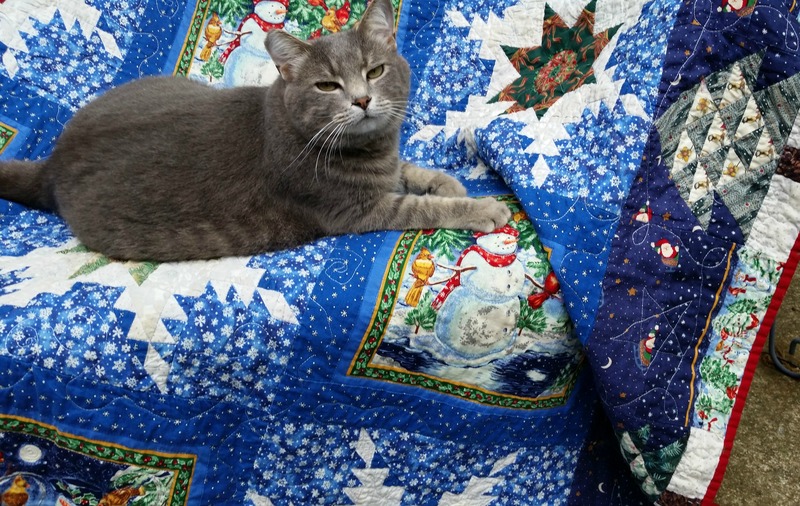 I started this quilt as a stash buster, possibly for donation. 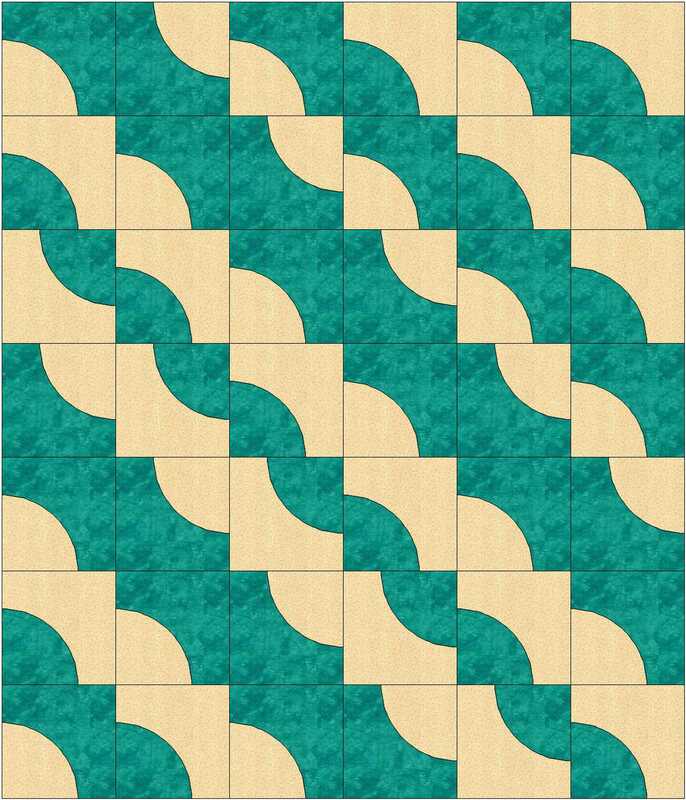 I had a lot of purples and greens that I wanted to use up, and I thought of a favorite block of mine, Windflower, which is a variation of Drunkard’s Path. 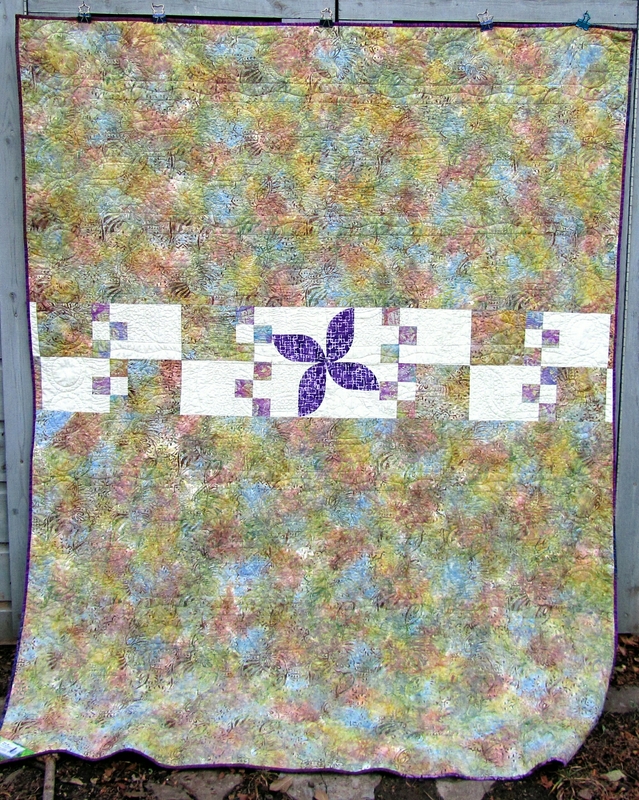 The flower centers are done with “Rainbows” by Superior Threads. All the other stitching is with “Bottom Line”, also Superior. 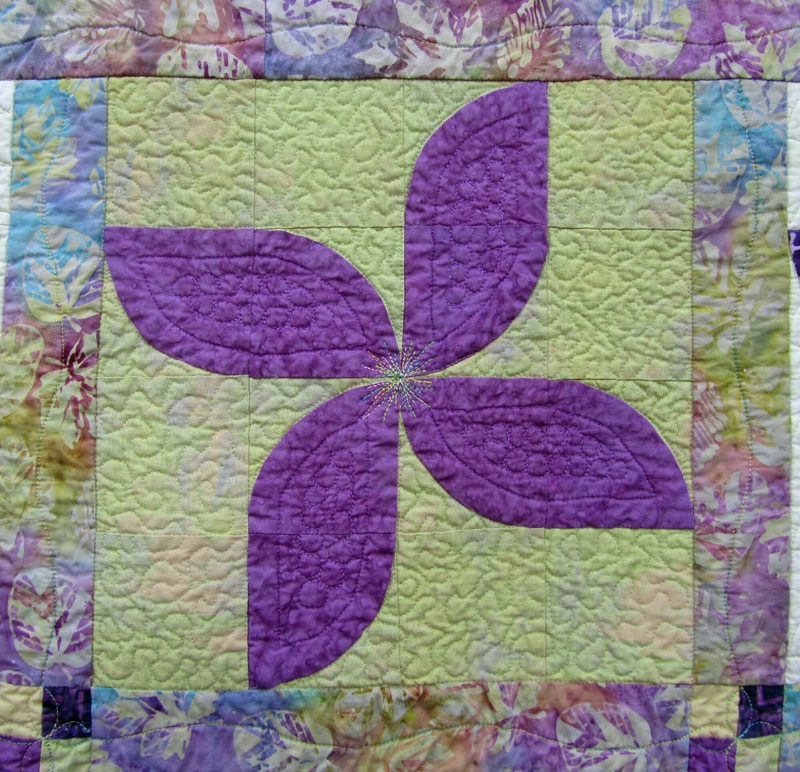 The violets are quilted with “pebbles” and outlines. I used three different background fillers in the green backgrounds around the flowers. 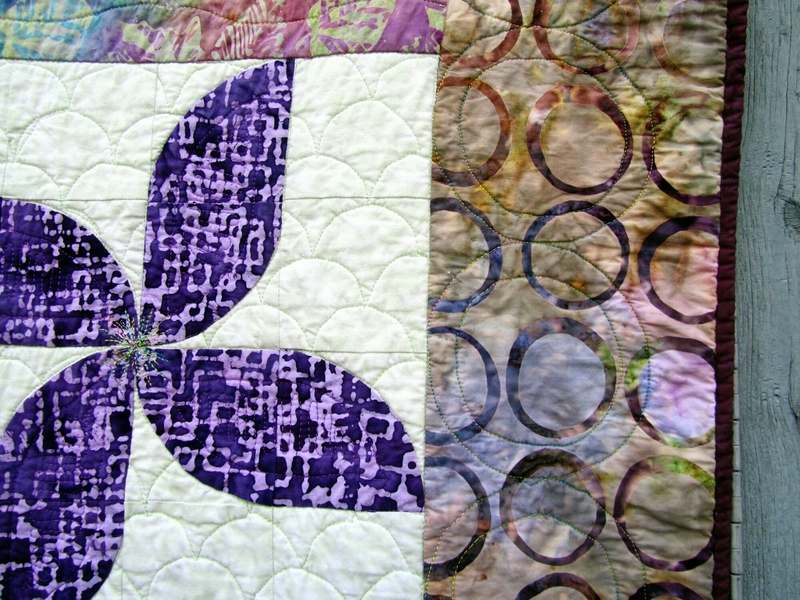 The borders have rings that mimic the “coffee rings” on the batik. 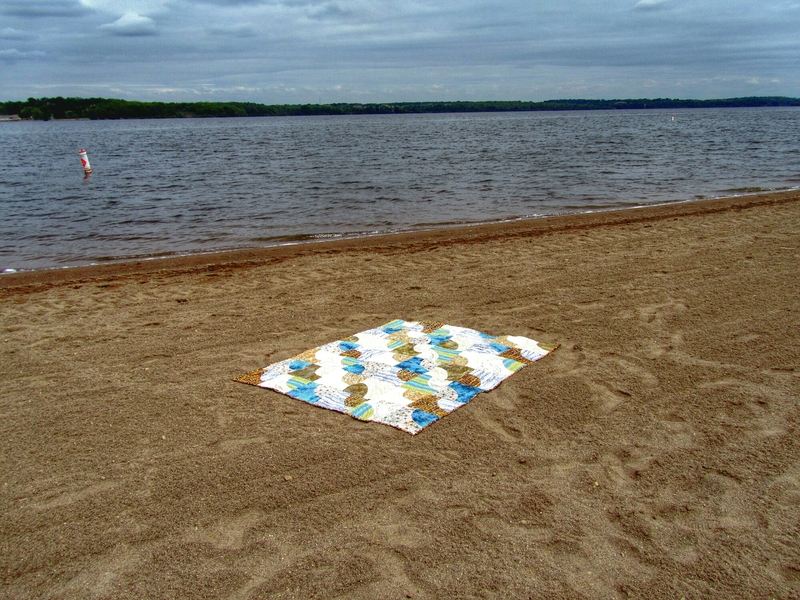 It ended up as a meticulous, lengthy project, especially the quilting, and I’m now too attached to it to part with it. It makes me happy. 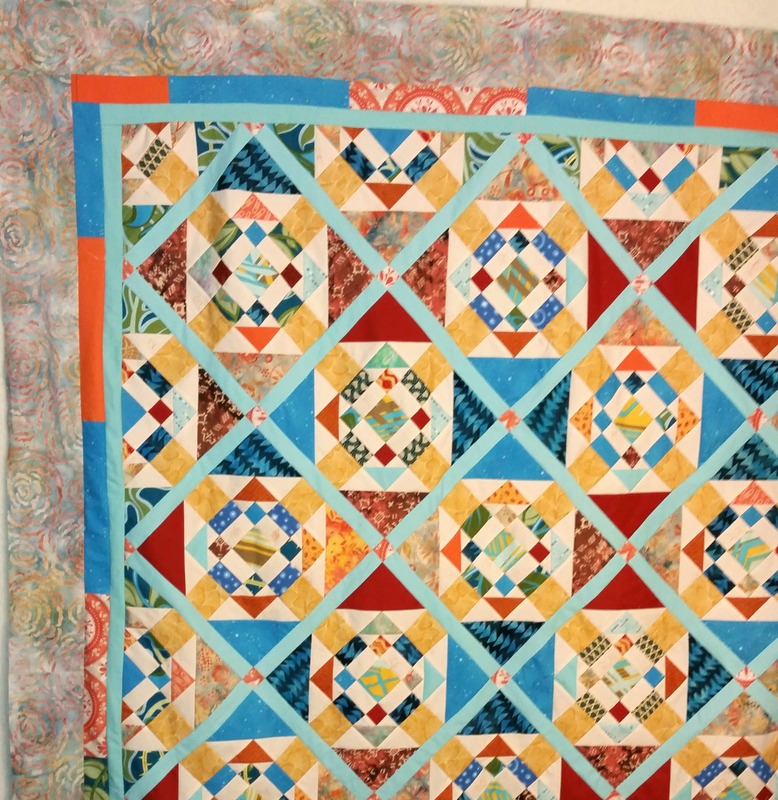 See all the entries at the Blogger’s Quilt Festival at Amy’s Creative Side. Voting begins May 22! 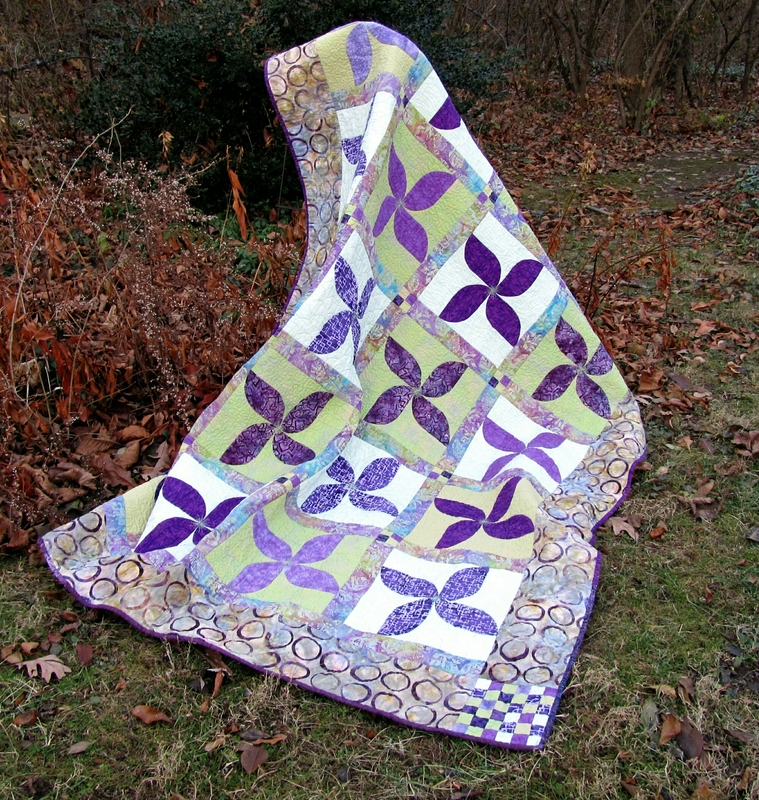 Categories: Uncategorized | Tags: drunkards path, Evening in the Garden, Quilt Festival, Spring violets, superior threads, Valerie Root, windflower | Permalink. 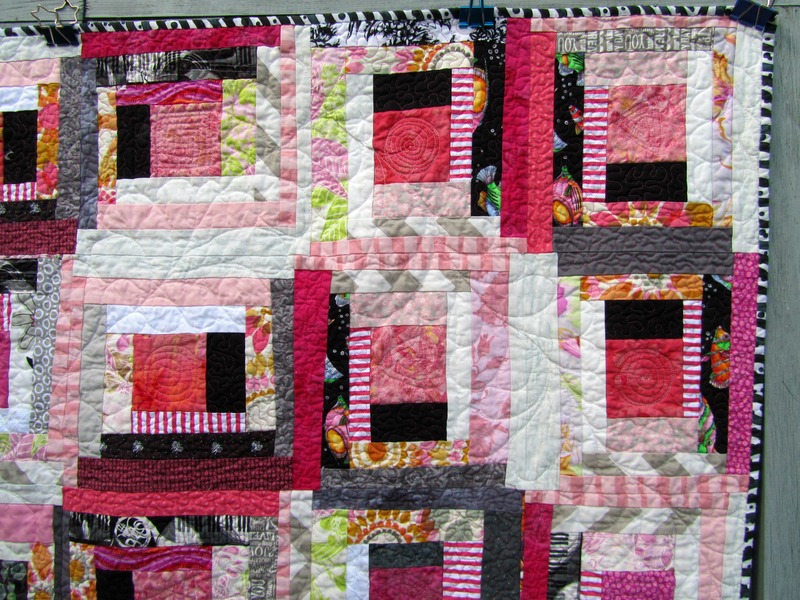 The wonderful thing about a patchwork quilt is that it is warm and cuddly, colorful, and full of interesting fabrics to examine, whether it has any great artistic or design qualities to it at all. I made this one to donate (along with it’s counterpart), and I’m confident that it will be loved. 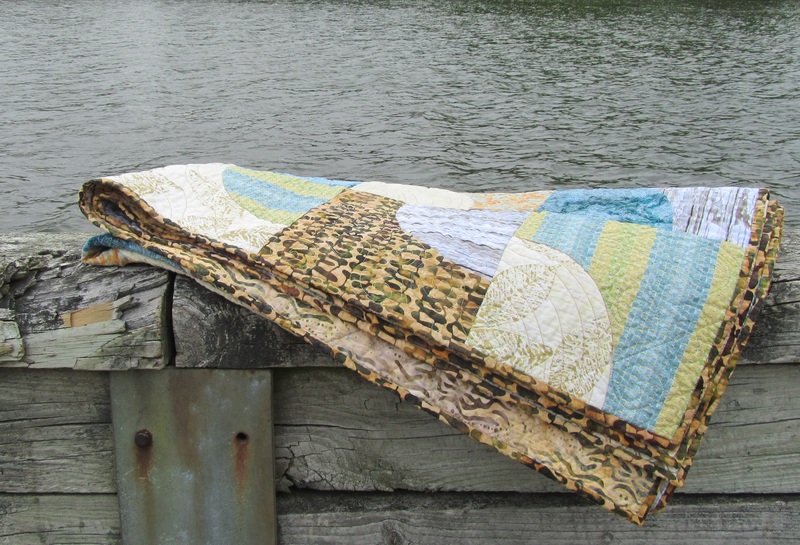 I know it looks like a barn raising log cabin quilt from a distance. I think all the blocks are at least turned right. 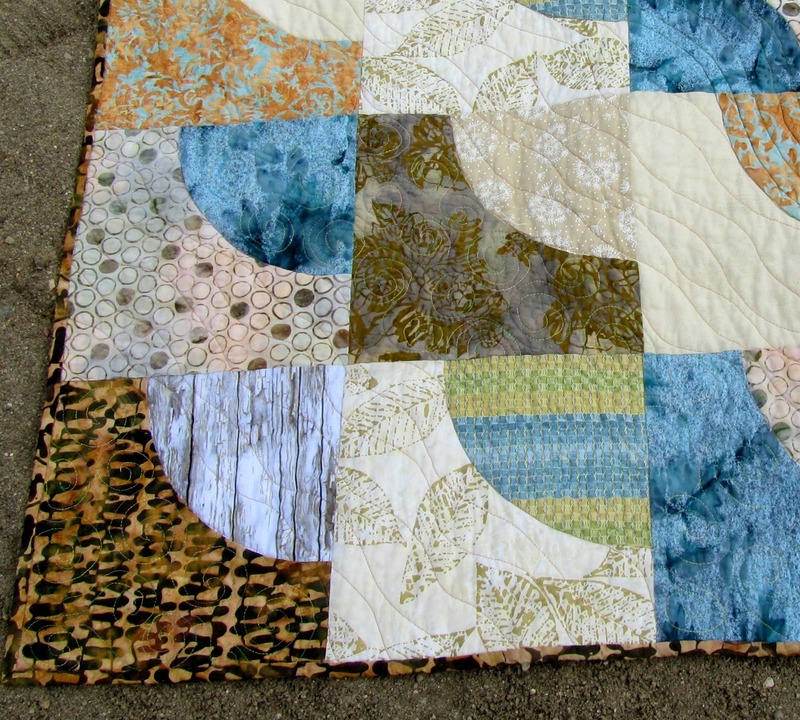 I used eyes from all over the world on this (the #Twilters), and still found one turned wrong when I was quilting. (No, it wasn’t the one of which we were suspicious, lower right corner. This was on the other side!) 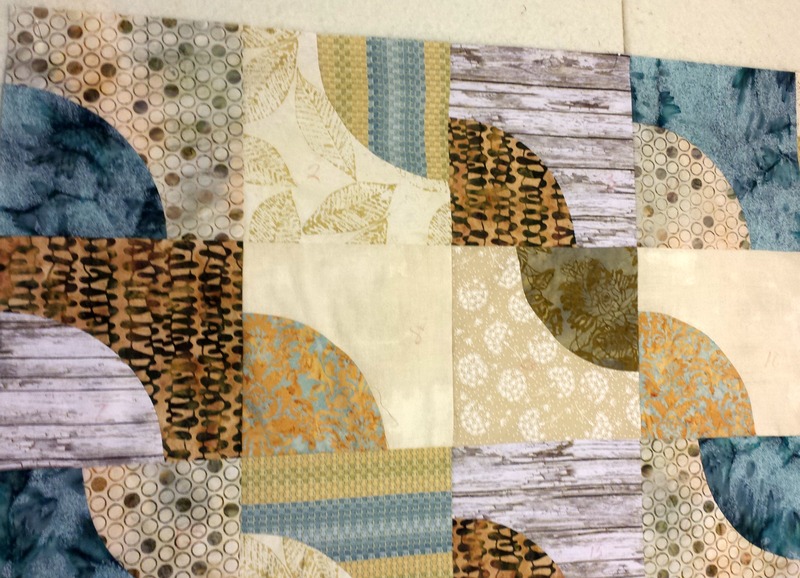 I took out the quilting, ripped out the block, sewed it back properly, and then resumed the quilting. But up close… whoo, boy! Up close, everything runs together. At least the colors are pretty. 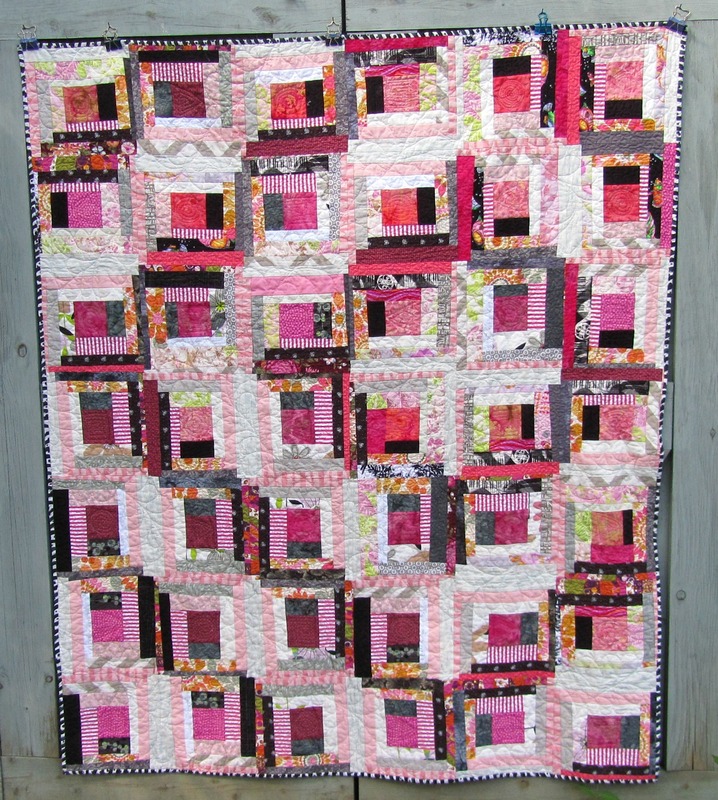 I quilted feathers into the light areas using pale pink Bottom Line by Superior, and stippled the dark stripes with magenta Bottom Line. I really think that improved things, helping to unite the fabrics. The center designs are done in gray Sulky. I admit I make string blocks when I want mindless sewing therapy, but I did think about the fabric placement on these. I just didn’t get it quite right. Part of the problem is the large scale print fabric I have in my scraps. It’s very difficult to categorize as light or dark, and sometimes a particular section will be the lighter than the rest, or darker. And there was one print that I was determined to use, since I liked it and had a lot of it. I decided I would make it a “dark”. We know value is relative, depending on the surroundings. And, you know, from a distance, it does work. But not really up close. So I learned. Yuri and I still like it and think that it will comfort someone. That’s success. 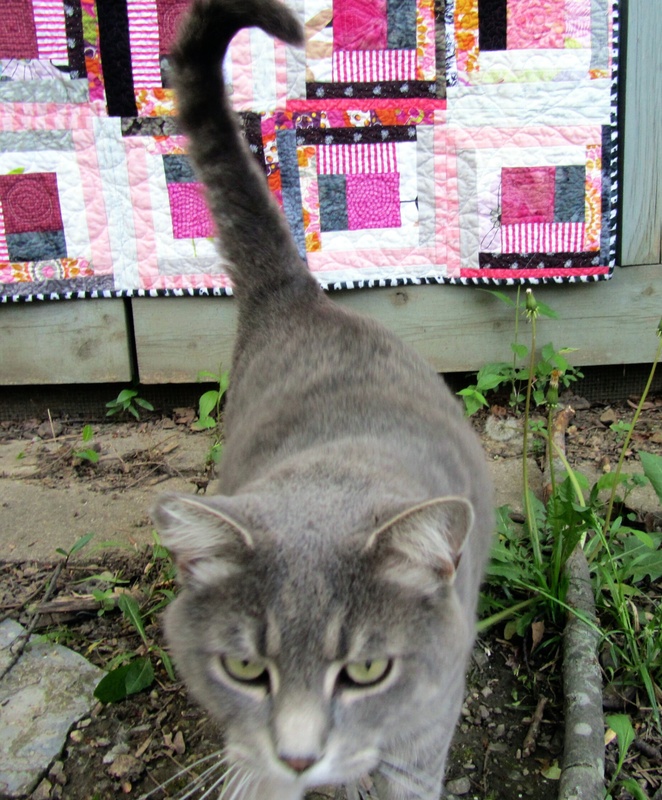 I’m linking up with WIPs Be Gone at A Quilting Reader’s Garden.